If you're in QLD then you'll know its been a bazillion degrees the last few days, if you're not, well lucky you. The problem I have with the heat is that my air conditioning has decided to be temperamental and of course not work on hot days and our complex doesn't have a pool. There's enough room for one so I don't know exactly what they were thinking when they built the complex, but I'm not holding my breath that they'll ever put one in. To overcome this and escape the heat I've had to think out of the box because a hot, sweaty toddler = a very cranky toddler and nobody wants that. When I was younger we used to run under the sprinkler to keep cool and it was so much fun. I'm pretty sure if I bought a super duper long hose to set up a sprinkler in the communal grass area and started running through it people would think I had a few screws loose. Plus I don't think they sell hoses that long, so that's out. The next best thing was to get a blow up pool for the backyard. I didn't just get a run of the mill kiddies pool though, this is the coolest kids pool I've ever seen. It's like a kids pool + ball pit + play centre combined. We got the Bestaway children's pool from Crazy Sales which is a 1.5m x 1.5m pool that also has a built in ring stacker, ball ramp and arch with inflatable mobile. It combines normal water play from a swimming pool with a bunch of added cognitive play stations. It keeps kids entertained for much longer than a standard inflatable pool and the fun part is us parents can join in too. We used an air pump to blow up the pool, because ain't nobody got time to manually blow it up. If you get it and you don't have a pump I suggest you get one because it'll be well worth the investment. Ours only has two attachments and the ramp part was slightly too small for our smallest pump attachment, but with some strategic wriggling and twisting T got it to work. The rings need to be manually blown up and I couldn't get it to work no matter how hard I tried, but that's why we have these wonderful things known as men who somehow just seem to be able to do stuff like that without even trying, so it was all good. I love that the pool comes with a repair patch too just incase an accident happens (or a cat tries to take out the pool) and we get a puncture. The first thing she noticed was the hanging mobiles on the archway which she was instantly drawn too. She used to have moons and stars hanging from the mobile above her bassinet and she was obsessed with them so the fact that this one has a moon, a star and the sun probably helped to draw her attention. The archway is a good height for a toddler because she could just reach them while she was sitting down and could also stand up to play with them. Word of warning though do make sure children are supervised at all times because madam decided it'd be fun to pull the arch down flat and climb over it in the pool, which was fine but could be dangerous if she slipped. Ah the joys of having a daredevil child who likes to push the boundaries. The ring stacker is a really cool feature and I was quite proud that she figured out how it worked straight away without being shown what to do. The pool comes with three inflatable rings - two green stars and one pink circle. She likes to go between stacking them, pushing them around the pool and then trying to wear them on her face as a mask (yes shes special). She even tried to roll one of the green ones down the ball ramp at one stage. Without a doubt the best part of this pool is the ball ramp. Whoever thought of that is my new best friend. Its the most fun ever. The pool comes with six balls for the ramp and we discovered her other plastic balls also work in the ramp so we could essentially turn the pool into a floating ball pit if we wanted to. We added to the fun of the ball ramp by pointing the hose down the ramp as the pool was filling up so it turned into a makeshift waterfall at the end. 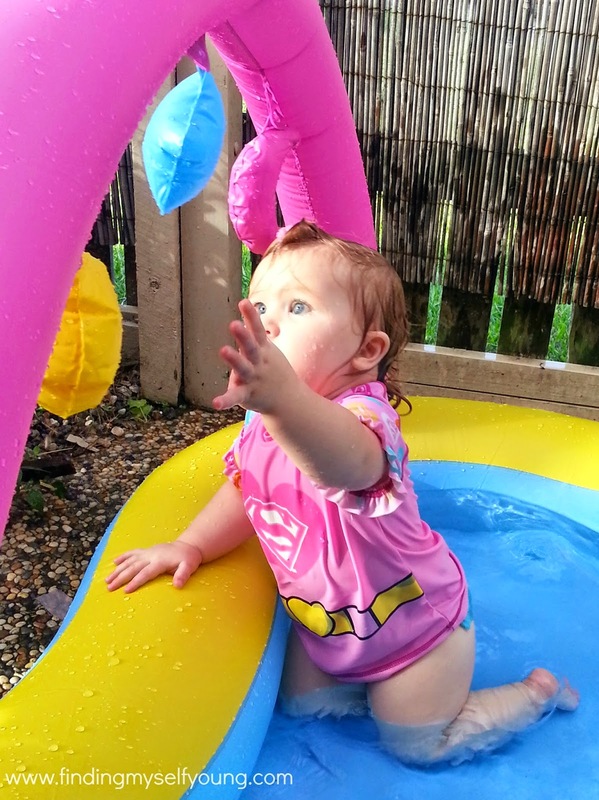 She spends most of her time in the pool playing with the ball ramp and gets us to join in with her too, although as you can see from the video shes also little miss independent and makes it obvious she knows how to do it all by herself. At only $37.95 this pool is probably one of the best investments you'll ever make. Its a great size for toddlers and I can fit in there too if I wanted to (which I may very well do if it stays this hot). 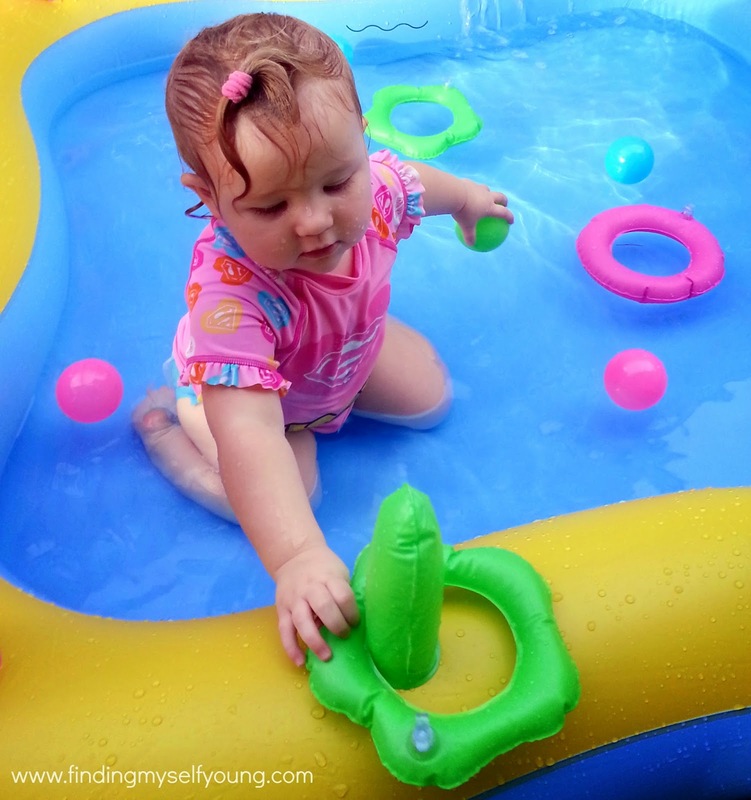 She is thoroughly entertained by the play options as well as playing in the pool water itself. Playing so much in the pool also wears her out and means a much easier bed time and that my friends is priceless. 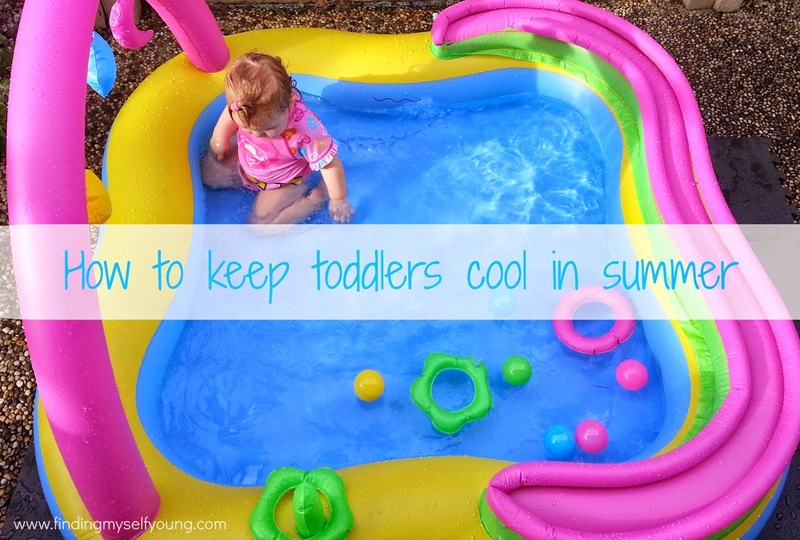 Are you lucky enough to have a real pool or do you have to make do with a kiddie pool like me? Disclosure - I was asked to review items for Crazy Sales and chose this inflatable pool. All opinions expressed are my own based on using the product. I did not receive payment for this post. This post may contain affiliate links. I do not have a pool, I want one desperately!! Love this fun kids pool. I might have to look it up!! I want a real pool so bad! When we finally get around to buying a proper house we want one with a pool, but I have to say I'm kind of glad we've only got a kiddie pool while shes so young because it causes less heart attack moments for me! Fantastic idea! Love the blow up pools, and this one has cool accessories. So many cool accessories, I've never seen anything like it before. $37??? Bargain much?? Kids just LOVE water don't they? We don't have a pool although my sister in law lives around the corner with one. That's handy. However the boys are enjoying the simple sprinkler on the tramp trick and running around with hoses this summer. If they're happy, I'm happy! But the $37 blow up pool is seriously tempting. I've never lived in a house with a pool my whole life (deprived much) which I guess is why I want one so bad. I so wish we had a big enough backyard so we could do the sprinkler under the trampoline, I loved that SO much as a kid. Looks fantastic and lots of fun! Better than the little clam shell sand pit that we have. I live in Queensland, I get it :). What great fun, it's these special memories that lay the foundation of our relationships. Water is a blessing this time of the year and what fabulous accessories to add to the play experience. Our family home has a swimming pool, which is a blessing :).